STEVEN STROGATZ is the Jacob Gould Schurman Professor of Applied Mathematics at Cornell University. A renowned teacher and one of the world’s most highly cited mathematicians, he has blogged about math for the New York Times and The New Yorker and has been a frequent guest on RadioLab and Science Friday. He is the author of Sync and The Joy of x. He lives in Ithaca, New York. "...wonderful...bringing the insights of calculus—among the most important of all developments in the history of mathematics—to everyone." "I've never read a clearer explanation of calculus or the significant powers we gained by harnessing infinity. Michael and I highly recommend it!" 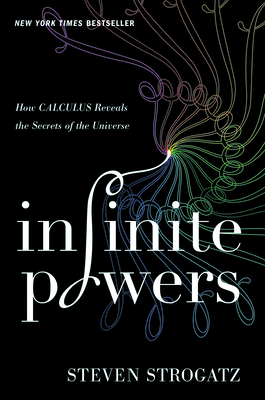 "Fascinating anecdotes abound in Infinite Powers...Strogatz uses the right amount of technical detail to convey complex concepts with clarity...evocatively conveys how calculus illuminates the patterns of the Universe, large and small." "A brilliant, appealing explanation of how calculus works and why it makes our lives so much better." "Strogatz does a great job of explaining a difficult subject...he lays out the case that calculus is fundamental to the way we live today...a solid choice for readers who want to know what calculus is all about, and for teachers who wish to improve their presentation." “Far-ranging survey . . . clear and accessible . . . Strogatz successfully illuminates a notoriously complex topic and this work should enhance appreciation for the history behind its innovations."